Rachael Ray crafted her show around a tasty family recipe that can be used as a jumping-off point for several other dishes. Her grandfather’s Braised Beef Recipe (a.k.a. Italian Style Pot Roast) got things off to a tasty start, all thanks to Rachael’s grandfather. Do you have a favorite family recipe that you love to make and share with others? “When it comes to saving money, especially in your kitchen, one of the top tips I can give anyone is to learn how to cook big,” Rachael said. You can cook a whole chicken or a large roast and plan on using the leftovers. There are many different ways to make your meals stretch. Cooking in batches like this takes care of the expensive protein and helps you prepare multiple meals that could last you several days, even if you are only cooking for one or two. 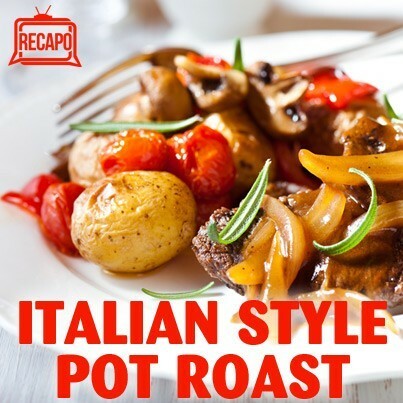 Rachael Ray prepared her Grandpa’s Braised Beef Recipe, also known as an Italian Style Pot Roast, for her show, making a meal with guaranteed leftovers. Heat olive oil on medium in a large skillet. Sweat onions and garlic in the skillet for 20-30 minutes, until they turn light caramel and become soft. Season meat generously with salt and pepper. On medium high, heat olive oil in a dutch oven and brown the meat all over. Use wine to deglaze the pan. Arrange half your onions atop the meat. Season this with thyme, salt, and pepper. Arrange half your potatoes on top of the onions. Dress this with olive oil, salt, pepper, rosemary, and Parmigiano. Atop the potatoes, pour half the tomatoes with their juices, also seasoning this layer with salt and pepper. Scatter basil leaves over this. Repeat the layers of onions, potatoes, and tomatoes. Cover and roast for 2 1/2 hours. Turn off the heat but leave the pot in the oven for one more hour. Once finished, cut in chunks and serve cooking sauce on the meat.